Jeremy Lin, Houston Rockets: The NBA is designed to protect teams from their own stupidity, but nobody could save the Knicks. The NBA is designed to protect teams from their own stupidity. 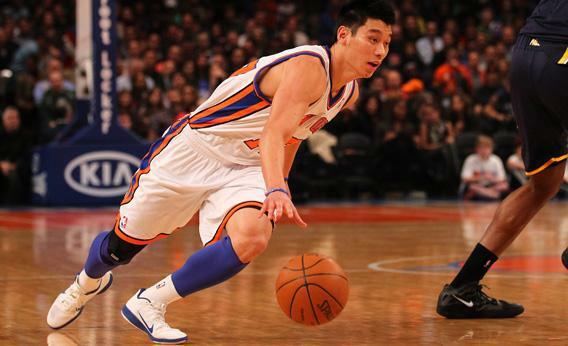 Here’s how New York lost Jeremy Lin anyway. match for mind-blowing managerial incompetence. The NBA’s rules are designed to protect stupid teams like the Knicks from their own stupidity. The draft lottery rewards the worst franchises with the best picks. The maximum salary ensures that teams won’t spend too much on star players, who are drastically underpaid as compared to their value on an open market. And David Stern’s move to ban players from turning pro out of high school was designed to bring more certainty to player evaluation—to save scouts and general managers the embarrassment of taking a bust like Kwame Brown with the No. 1 pick. The Knicks prove that no matter how much the league tries to help its least-competent franchises, stupidity always finds a way. New York was smart to pull Lin off the scrap heap, but it took James Dolan’s franchise just a few steps to transform good fortune into the morale-killing eviction of the player who’d revitalized a long-moribund team. With the exception of the cagey Rockets, nobody who cared about the fate of Jeremy Lin’s career—Lin (“Honestly, I preferred New York,” he told SI.com), pitchfork-wielding Knicks fans, and the Knicks themselves—got what they wanted this week. And the reason Lin’s offseason has been such a bizarre failure is the same reason his 2012 season was so uplifting: Six months ago, when nobody thought he could play, he landed in exactly the wrong place. After four years at Harvard, Lin didn’t get picked in the 2010 NBA Draft. When he eventually signed with the Golden State Warriors, the Taiwanese-American point guard took a deal that paid him around $500,000 in his first year. After getting cut by the Warriors and the Rockets the following season, he got an annual salary of $762,195 from the Knicks in 2011-12. It’s that six-figure deal, not the new one paying $8 million annually, that most misrepresented Lin’s value. Even as he gained a tenured position on the cover of Sports Illustrated, Lin was the best bargain in basketball. The Knicks were getting a franchise point guard for the price of end-of-the-bench, towel-waving roster filler—Chris Paul at Alonzo Gee’s salary. If Lin had been a coveted college player, he would’ve gotten a longer-term, guaranteed deal instead of a short-term, low-salary contract. But once he started to play like Walt Frazier, Lin had the benefit of becoming a free agent at 23, an age when other players were still locked in to their rookie deals. The Knicks, then, got Lin for cheap at the cost of having to turn around immediately and pay him something closer to market price. Perhaps it was bad luck for the Knicks to blunder into a rare situation where the NBA’s overprotective rules couldn’t save them. As this New York Times primer explains, the league created the Gilbert Arenas rule in the mid-2000s to make it easier for teams to resign players like Arenas and Lin who’d outplayed their rookie deals. Even though they’re over the salary cap, Lin’s status as a restricted free agent meant the Knicks could match any other team’s contract offer. NBA contract law, though, did not foresee that a team like the Rockets could sign Lin to a booby-trapped offer sheet designed to exploit the Knicks’ comically mismanaged payroll, which allocates more than $62 million to just three players (Carmelo Anthony, Amare Stoudemire, and Tyson Chandler) in 2014-15. As a consequence, the Knicks would have had to pay something like $43 million for the privilege of having Lin in the 2014-15 season—his salary plus exorbitant luxury tax penalties—if they’d matched the Rockets’ offer. * It was that $43 million figure that finally led the NBA’s drunken sailors to sober up. A business school could design a whole year’s curriculum around the Knicks’ cascade of self-harm. It’s as if the team bought a valuable antique rifle for $1 at a flea market, shot themselves in the foot while fooling around with it, then chose to shoot themselves in the head rather than get the foot amputated. Last year, Jeremy Lin showed how joyous it can be to watch someone prove game after game that every team made a mistake. This July, the Knicks have shown that it’s a lot less fun when it’s just one team that keeps on screwing up.